Las Vegas is not immediately associated with great natural landscapes, but no tour of the national parks and scenery of the Southwest would be complete without at least one day visiting the spectacular casinos of The Strip - the main road through this energetic desert city. 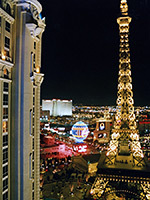 Apart from its own famous man-made attractions, Las Vegas is a good base or starting point from which to explore this part of America - together with Phoenix in Arizona, it is the most central major city in the region, with good international airline connections and all necessary facilities. Nearby natural attractions include Mount Charleston, Red Rock Canyon, Tule Springs Fossil Beds, Valley of Fire and Lake Mead. 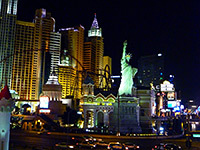 Ninety nine percent of Las Vegas is like any other large American city, although with an unusually impressive setting, flanked in most directions by distant rocky mountains, close to the clear waters of Lake Mead and with a particularly mild climate - hot in summer (up to 110°F) but a pleasant 70 to 90°F for most of the year. 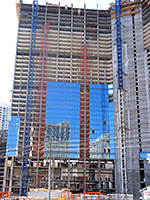 It is the fastest growing city in the US for obvious reasons but this growth is likely to cause problems at some time in the future, especially with ensuring a sufficient supply of water. Climate and weather for Las Vegas. Take a nighttime tour of the major casinos on the Las Vegas Strip, beginning in the north at Stratosphere and ending in the south at Mandalay Bay - or use the map below to jump to a specific casino. 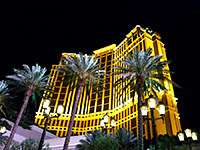 Each page also features hotel information and reservations. 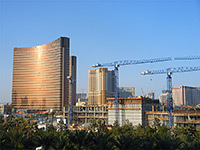 Alternatively, view a map and summary details for the major casinos. 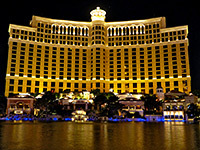 For regular accommodation away from Las Vegas Boulevard, see the hotel description pages for Las Vegas, North Las Vegas and Henderson. The four mile array of hotel complexes dominates the Las Vegas skyline when seen from afar, particularly when approaching the city from the north, along I-15; this leads up a barren ridge, typical of the empty desert scenery along the previous 60 miles since the Arizona border, and suddenly, ahead lies this sprawling city of nearly one million people, half a mile below and still 15 miles away. 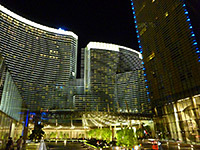 Even at this distance, the shapes of the casinos are recognizable although to reach and enter one may take another half an hour. The other three main routes into Las Vegas have a similar dramatic change from desert wilderness to urban development (or maybe to urban wilderness). US 95 is the least traveled - this crosses wonderfully stark land with sweeping vistas, extremely hot in summer, between Death Valley National Park in California and the huge Nellis Air Force Range in Nevada. I-15 from the south comes from Los Angeles across the Mojave Desert, while US 95 continues southeast, and joins with US 93 to the Hoover Dam and beyond to Arizona. The approach on these two roads from the south illustrates how rapidly Las Vegas is expanding, with large areas of previously untouched desert being turned into luxurious gated estates and other housing projects. 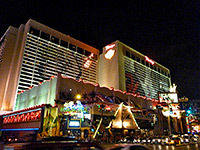 The casinos and associated 24-hour entertainment are the main attractions of Las Vegas; they are found along various main roads and are concentrated in two areas; firstly downtown, around the junction of East Fremont Street and Casino Center Boulevard, where the establishments cater for the more serious gambler. 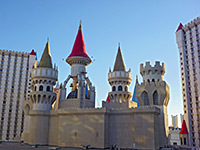 The second, much larger area is along Las Vegas Boulevard - 'The Strip', where huge, often family-oriented casino/hotel/leisure complexes line both sides of the 6-lane thoroughfare for four miles, from the 1,149 foot Stratosphere at the north end to luxurious Mandalay Bay at the south, just opposite McCarran International Airport. 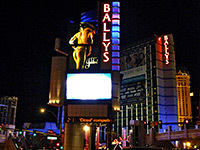 Inside, all casinos are essentially identical - countless rows of noisy, flashing, rolling slot machines extending in all directions with occasional quieter areas reserved for roulette and card games, principally poker, baccarat and craps, although the serious, big-money gaming takes place in private rooms away from the tourist crowds. The reaction of most winners on the slot machines seems to be indifference; the coins paid out are fed back at once, and the general air is a mixture of dazed enjoyment and slight bewilderment. The lack of windows, clocks and obvious exits are just some of the devices used to keep the punters occupied as long as possible, and while some aspects could be considered a little seedy, sad or depressing, most people find the casinos to be fantastic - whether just for a brief flirtation with the machines, an evening spent people watching at a bar, or just walking though.